The foundation for Hand in Hand Academy for Social Entrepreneurships is the 10 years of grassroot level experience culminated by the Hand in Hand India team. This experience is being translated in a structured manner in the form of knowledge transfer to individuals passionate about social entrepreneurship.The team realizes the pivotal role of business and management principles to supplement enterprise creation. Hence The Academy is to offer a range of courses from business management to banking & technology! The Vision of the Academy is to create socially responsible management professionals who will find inclusive, innovative and insightful solutions to bring about positive change. The Mission is to offer a mix of academic programmes to passionate individuals to equip them with tools and insights for creating sustainable enterprises. 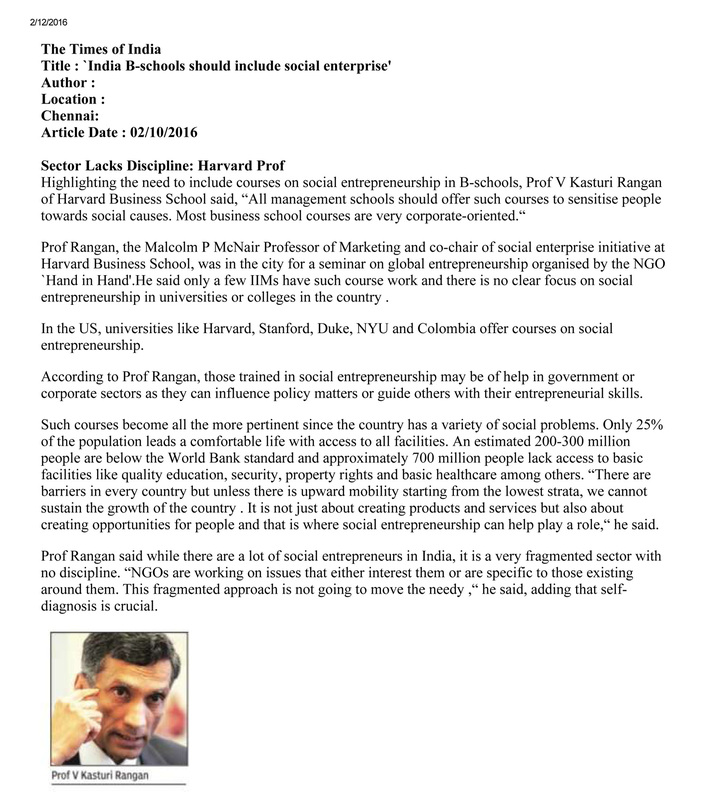 HAND IN HAND ACADEMY FOR SOCIAL ENTREPRENEURSHIP is a place to develop entrepreneurial skill set in people. It will help them to set up their own ventures, expand their existing family businesses or be an intrapreneur. The participants will get exposure to THINK entrepreneurially. HIH Academy through excellent quality delivery of international standards, will bridge the gap between Theory and Practice. Motivate and educate participants in entrepreneurship by conducting awareness programmes, academic courses and training programmes. The platform of HIH Academy will provide incubation, mentoring and financial services for technology as well as business development. The purpose of the HIH Academy is to provide an entrepreneurial ecosystem to experience and energize themselves. A HEARTY WELCOME for an exciting journey of entrepreneurship in the HIH ACADEMY world of entrepreneurship to get exposed and experience the Energy. The objective of Hand in Hand Academy for Social Entrepreneurship is to create an enabling environment for social entrepreneurship to flourish and become a viable proposition for stakeholders across the ecosystem comprising government, academia and private sector players. 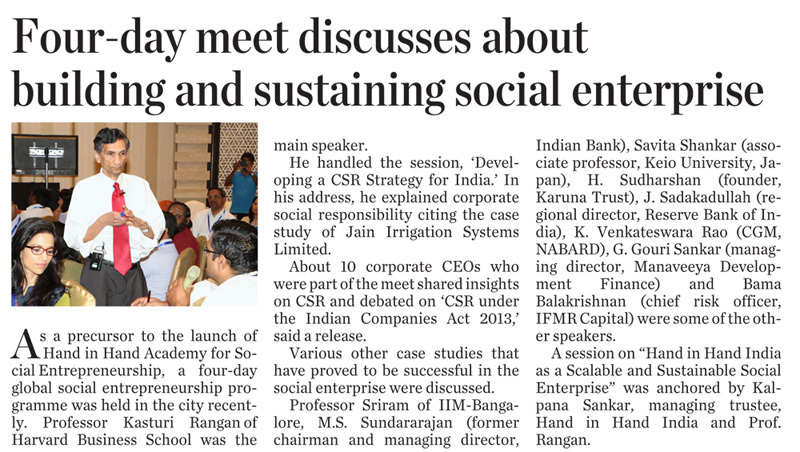 In doing so, Hand in Hand Academy for Social Entrepreneurship envisages social entrepreneurship to be an integrated and holistic venture, which balances social mission with technical expertise, business acumen and sustainability. At the same time, the Academy aims to provide a meaningful balance between theoretical classroom and practical field exposure to Hand in Hand India's grassroot level operations. Going forward, Hand in Hand Academy for Social Entrepreneurship will ensure through its teachings that courses should address issues of scale, impact, replicability and adaptation to cultural and social contexts. 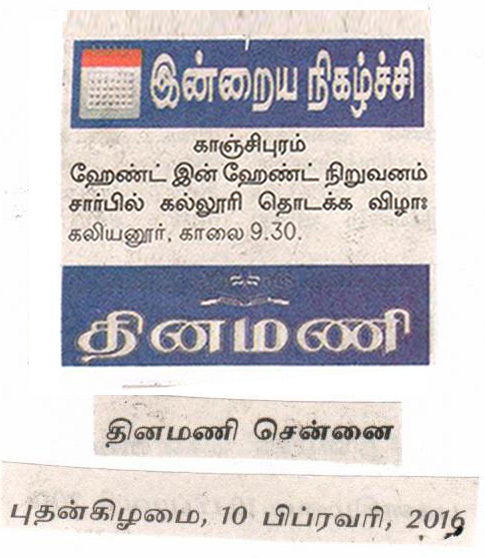 Hand in Hand Academy for Social Entrepreneurship is located in the district of Kancheepuram, bordering the city of Chennai. The academic building is a 2-floored dome structure built up over 15,000 sq. ft. housing 6 training halls, an auditorium and a library in a total land area of 1 acre. The academy is built with an aesthetic sense of promoting learning with international facilities and infrastructure. The Hand in Hand Academy for Social Entrepreneurship team is constituted of senior management staff of Hand in Hand India. The team is supported by a strong set of mentors and faculty from universities around the world and corporate tycoons. 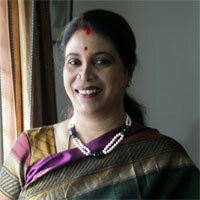 Dr Kalpana Sankar holds a Ph.D in Physics and another in Gender Perspectives on Women. She has also completed an Executive MBA from TRIUM. 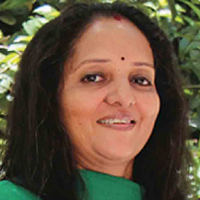 Dr. Sankar specializes in poverty assessment, participatory assessment of Self Help Groups, NGOs, participatory rural appraisal, gender-differentiated impact, She has handled several international missions in Rome, China, Vietnam, Ethiopia and Maldives and received special commendation from United Nations Office for Project Services, Bangkok. 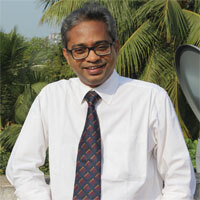 Dr Sankar is currently the Chairperson and Managing Trustee of Hand in Hand India. She co-founded Hand in Hand India in 2004. With over two decades of experience in rural banking, Dr. N. Jeyaseelan has piloted several microfinance initiatives in the banking sector, including the Indian Bank's Special Unit for Microfinance Project. A PhD in Microfinance, he has done several assignments in self-help groups, microfinance and micro insurance programmes across several countries. He has served as consultant to the UNDP, UNOPS, GIZ, IFAD, Agricultural Finance Corporation, Tamil Nadu Corporation for Development of Women Ltd, and Water Partner International (USA). 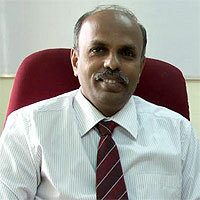 Mr. Srinivas supports us with the preparation of strategic plans, evaluation of programmes and proposal writing. He has helped implement a project for Asian Development Bank in Madhya Pradesh through which capacity building training and access to energy-based business opportunities were provided to rural women. He also works to procure consultancy assignments and has worked closely with institutional donors in the area of monitoring and evaluation, scoping studies, needs assessments and conducting baseline and end-line surveys.Prior to joining us, Srinivas was the Head of Investment Banking with a large bank in the Middle East. He also had stints with a large consulting firm and a private sector Indian bank. Srinivas has a CFA charter from AIMR, USA, an MBA from XLRI Jamshedpur and a mechanical engineering degree from Mangalore University. 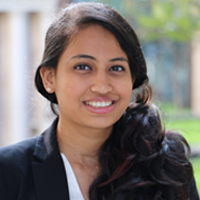 Ms. Sankar carries two hats as an Electronics and Communications Engineer as well as a Management graduate from London School of Economics and Political Science, where she specialized in marketing and strategy. Prior to this, Ms. Sankar has held various leadership and editorial positions during her education. She has worked with a start-up, Wimbletech in the UK for a year as the Financial and Community manager where she handled the audit, accounts and expansion strategy alongside a small team. She also has experience as a Strategy Consultant with Applied Value Group in Stockholm. 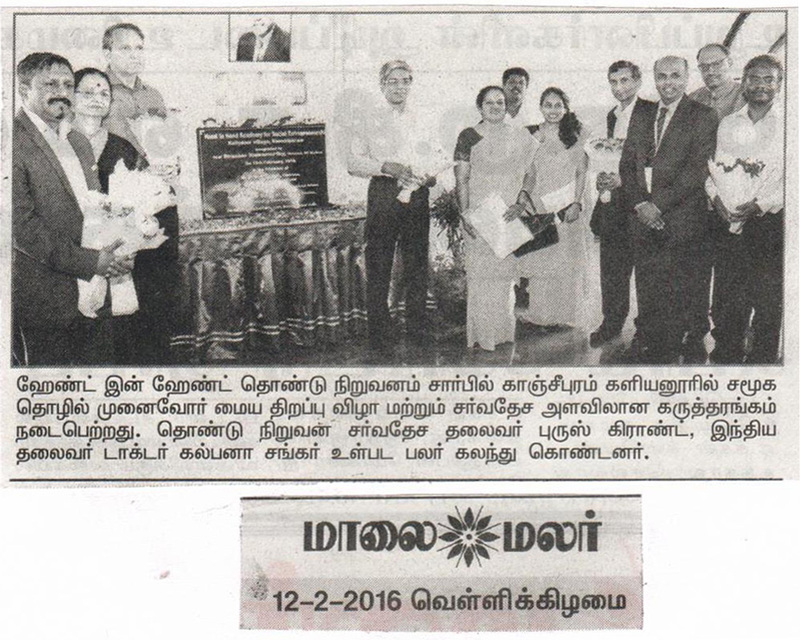 The second batch of Certificate Programme in Banking (CPB) course was launched at Hand in Hand Academy for Social Entrepreneurship at Kaliyanoor on 26th October 2017. 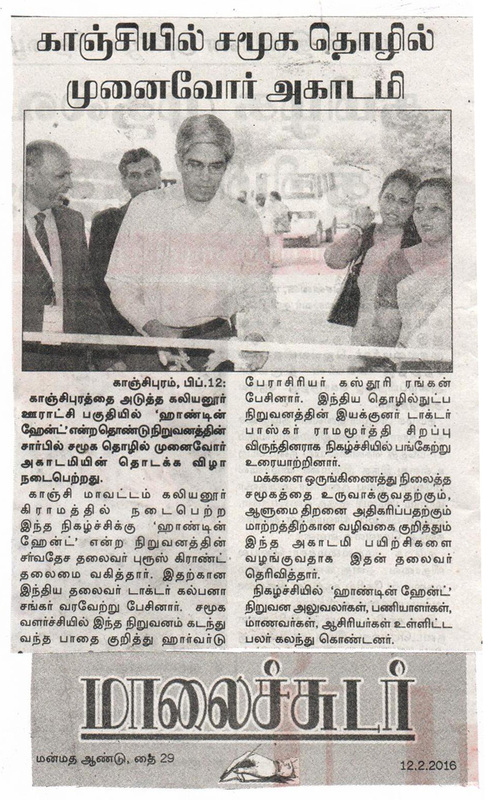 Dr S. Balaji, Dean of Hand in Hand Academy welcomed thegathering. 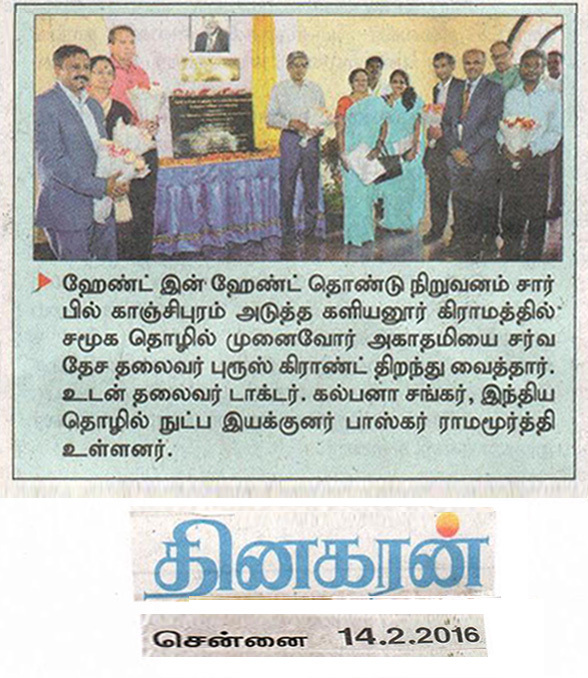 Speaking of the course, Dr N. Jeyaseelan, Group CEO, Hand in Hand India gave an overview of the six-month blended CPB course offered in partnership with Deen Dayal Upadhyay Kaushal Kendra (approved by UGC)of SCSVMV University Kancheepuram and the achievement of 100% placement facilitation for the first batch ofstudents. Mr Jinnah also released Hand in Hand Academy's "NEXT" newsletter. Dr G. Srinivasu, Registrar, SCSVMV University released the course booklet and offered to support Hand in Hand Academy’s upcoming course in "Environment Management". Dr Kalpana Sankar, Managing Trustee of Hand in Hand India delivered the keynote address. She explained the context under which the microfinance programme was launched by Hand in Hand India in 2004, to eliminate the issue of child labour in the silk weaving industry in Kancheepuram.She further emphasised how Hand in Hand India's credit plus model of Self Help Group-based microfinance programme has proved scalable and replicable as it had already been adopted in Brazil, South Africa, Afghanistan, Kenya, Cambodia and Myanmar. Dr K.P.V. Ramanakumar, Dean, SCSVMV University highlighted that during a review of Deen Dayal Upadhyay Koushal Kendra's programmes at New Delhi, the CPB course offering was greatly appreciated and that the committee had asked the university to upgrade it to a diploma and postgraduate diploma programme. Mr Mageswaran, General Manager, delivered the vote of thanks. Hand in Hand Academy is set to launch the course on Environment Management in November 2017.